LEGO STAR WARS - DEATH STAR 10188 NEW SEALED! Battle inside the Death Star! Recreate the action and adventure of the Star Wars movies with the ultimate Death Star playset! This amazingly detailed battle station features an incredible array of minifigure-scale scenes, moving parts, characters and accessories from Episodes IV and VI on its multiple decks, including the Death Star control room, rotating turbolaser turrets, hangar bay with TIE Advanced starfighter, tractor beam controls, Emperors throne room, detention block, firing laser cannon, Imperial conference chamber, droid maintenance facility, and the powerful Death Star superlaserplus much more! Movie-authentic Death Star environments include the Superlaser control room and target monitor, Imperial conference chamber, TIE Advanced hangar bay with moving launch rack, Emperor's throne room, droid maintenance room, detention block, trash compactor, and much more! Rescue Princess Leia from the detention block cell, then escape through the secret hatch to the trash compactor below! Reenact the final duel between Luke Skywalker and Darth Vader in the Emperor's Throne Room! Death Star measures 16 (41cm) tall and 16½ (42cm) wide! TIE Advanced measures 3½ (9cm) wide! Check out my other items including 5 Lego Skateboard designs! 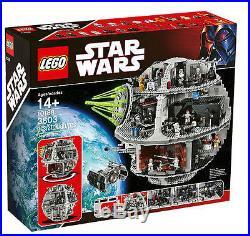 The item "LEGO Star Wars Death Star 2008 (10188) LEGO factory shipping box, new, unopened" is in sale since Tuesday, September 25, 2018. This item is in the category "Toys & Hobbies\Building Toys\LEGO Building Toys\LEGO Complete Sets & Packs". The seller is "starbase372" and is located in Carson, Washington. This item can be shipped to United States, Canada, United Kingdom, Denmark, Romania, Slovakia, Bulgaria, Czech republic, Finland, Hungary, Latvia, Lithuania, Malta, Estonia, Australia, Greece, Portugal, Cyprus, Slovenia, Japan, China, Sweden, South Korea, Indonesia, Taiwan, South africa, Thailand, Belgium, France, Hong Kong, Ireland, Netherlands, Poland, Spain, Italy, Germany, Austria, Israel, Mexico, New Zealand, Philippines, Singapore, Switzerland, Norway, Saudi arabia, Ukraine, United arab emirates, Qatar, Kuwait, Bahrain, Croatia, Malaysia, Brazil, Chile, Colombia, Costa rica, Panama, Trinidad and tobago, Guatemala, Honduras, Jamaica, Antigua and barbuda, Aruba, Belize, Dominica, Grenada, Saint kitts and nevis, Saint lucia, Montserrat, Turks and caicos islands, Barbados, Bangladesh, Bermuda, Brunei darussalam, Bolivia, Ecuador, Egypt, French guiana, Guernsey, Gibraltar, Guadeloupe, Iceland, Jersey, Jordan, Cambodia, Cayman islands, Liechtenstein, Sri lanka, Luxembourg, Monaco, Macao, Martinique, Maldives, Nicaragua, Oman, Peru, Pakistan, Paraguay, Reunion.